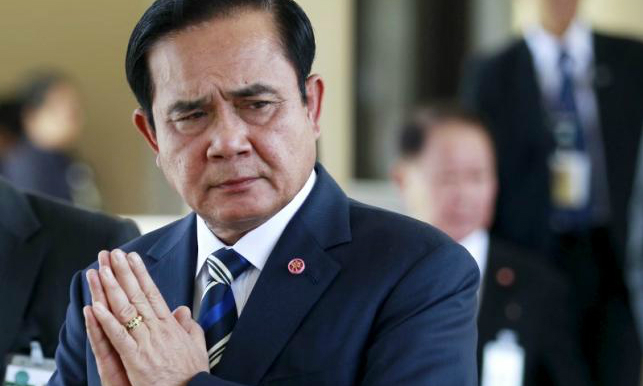 The leader of Thailand's junta on Thursday accused fugitive former Prime Minister Thaksin Shinawatra of being behind a series of small anti-junta protests that have flared in the capital this week. Rivalry between the former telecommunications tycoon and the military-dominated establishment has been at the heart of a decade of fractious politics and any suggestion Thaksin is stirring dissent is likely to raise concern about stability. The military seized power in May 2014, overthrowing an elected government led by Thaksin's sister, Yingluck Shinawatra, saying it had to maintain order after months of anti-government protests organised by allies of the establishment. The military government has banned protests and stifled criticism and anti-junta activity is rare. But since Monday, activists have gathered at various places in Bangkok to show opposition to a military-backed draft constitution and to protest against the detention of a former minister who spoke out against it. Asked by reporters who was behind the protests, junta chief Prayuth Chan-ocha replied: "Lobbyists living overseas and Thaksin." The army ousted Thaksin in a 2006 coup. He has lived in self-imposed exile since being sentenced to a prison term in 2008 on corruption charges he said were politically motivated. He remains hugely popular among his legions of poor, rural supporters and is still highly influential. With his huge wealth, he is seen as capable of supporting more active opposition to the government, if he chose to. Thaksin was not immediately available for comment but Noppadon Pattama, a former legal adviser to Thaksin, said in a statement that Thaksin was not behind the protests. "Thaksin Shinawatra has not employed any lobbyists overseas," he said. "He is not behind any government in exile." Several people have been detained at the protests but there has been no violence. Opponents of the military government, including Thaksin's supporters, object to the constitution that will be put to a referendum on Aug. 7, saying it would give the military sweeping powers. The military denies seeking indefinite power saying the constitution should heal divisions and usher in stable, clean politics. Watana Muangsook, who was a minister of social development in a Thaksin government, was taken into military custody on Monday over criticism of the constitution he posted on Facebook. Watana's lawyer, Narinpong Jinpak, told Reuters by telephone that he was with his client but he declined to comment. The government said this week campaigns, either for or against, would not be allowed in the run-up to the referendum. The military has promised an election by the middle of next year.